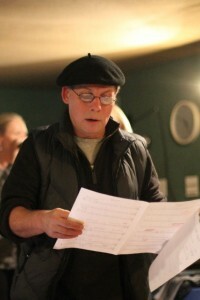 Peter is a formidable composer, song writer, conductor, arranger and record producer. I’ve met him over a decade ago in his role as Musical Director and arranger for the all star band ‘The Staxs’ (for which I had the pleasure to play with since 1999). When it came to adapting the Funkestra horn arrangements to Big Band (Pete was also involved in some of the 5 horn arrangements in the past), he was my natural ‘go to’ and we’ve had wonderful times talking about them for hours, if not days on end. Our collaboration on the Big Band arrangements seems to work well and I’m looking forward to writing many more arrangements with him. I absolutely love his ‘not a text book guy’ approach which helps me a great deal, always reminding me to keep my ears open! It is very difficult to summarise the array of top class amazing artists that Pete has work with – it nearly would be easier to list the ones he has not worked with. However, in addition of having enjoyed long periods as Musical Director for Iris Williams, Cilla Black, Shirley Bassey, Englebert Humperdinck as well as the Olympics Seoul Symphony Orchestra, he also conducted for Michael Jackson, Whitney Houston, Lionel Richie, Dean Martin and Petula Clark. Recording collaboration include George Michael, Paul McCartney, Oasis, Seal, Amy Winehouse, Sophie Ellis Bextor, Sting, Jamie Cullum and recently Cee Lo Green, Ne-Yo, Sigma & Rita Ora and Beyoncé. He also recorded with world class orchestras: L.S.O., Paris Nouvelle Symphonique, Count Basie Orchestra, Berlin Philharmonic and the Boston Symphony Orchestra. Pete is a classical trained piano player and stems from a musical family. His father was a clarinet player and his brother, Rico Tomasso, is a top jazz trumpet player. As children they’ve spent time in New Orleans meeting jazz luminaries such as Louis Armstrong, Oscar Peterson, Buddy Rich, and Dizzy Gillespie. After studying composition, orchestration, conducting and the piano, Pete hit the road with bands like The Three Degrees, The Supremes, Chuck Berry, Roy Orbinson, Ian Drury, Martin Wilde and Martha Reeves. This followed his entrance into the recording scene where he forged some key principles of his excellent work: ‘It’s all about listening!’ I whole-heartedly second this emotion.